This particular designation indicates the type of magnetic core that is used. The core is formed by a central column, upon which is placed the electric winding, and two outer columns which complete the magnetic circuit, enclosing the coil. 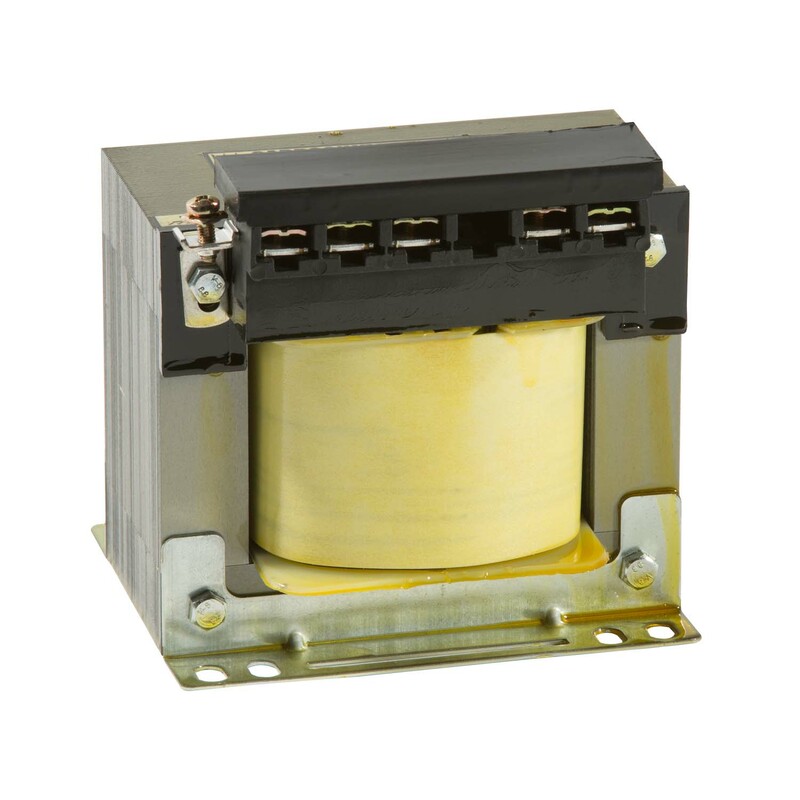 These single-phase transformers are manufactured in accordance with the CEI 96-1, CEI 96-2 (60742) and CEI 96-3 (EN61558) standards when the voltage is below 1000 V.
When it goes over this limit, we refer to IEC 14-8 (IEC 726). 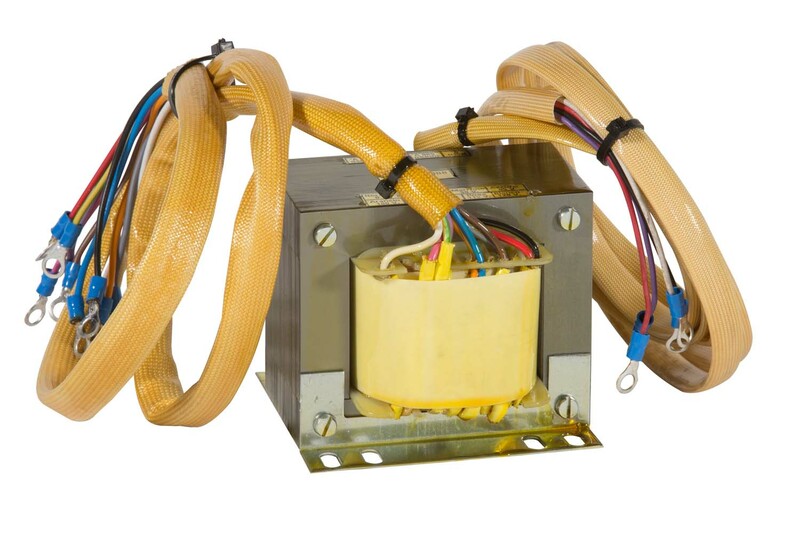 For SELV-PELV safety systems CEI-EN 61558-2-6 safety transformers (with secondary voltage not exceeding 50 Veff) should be requested, with a double or reinforced isolation. The isolating materials used in their construction are listed in classes F (155°C) and H (180°C). Degree of protection from IP00 to IP20. They are soaked in oven-dried paints and resins (guarantee of perfect isolation, quiet operation and reliability also in humid and tropical climates). Routine or type-based testing for each single device. On request they can be supplied with ELECTROSTATIC SCREENS AND THERMOSTATIC SENSORS inserted between the windings. The tables below show the indicative dimensions of the transformers, having an input voltage between 36 and 650V and an output voltage between 36 and 650V at a frequency of 50-60Hz. Construction with terminals on one or on two sides of the transformer depends on the number of input and output voltages from the single-phase transformer itself and on the type of isolation. DIMENSIONS MAY VARY DEPENDING ON THE NUMBER OF INLETS, OUTLETS AND CURRENT INTENSITY. From type 25.25 to type 40.60, they can be supplied in single packaging using environment-friendly cardboard. 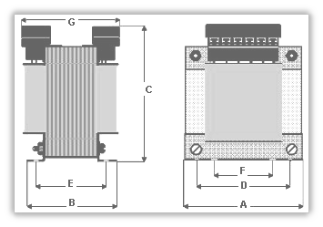 THE AUTO-TRANSFORMER IS A TRANSFORMERS WITH A SOLE WINDING COMMON TO BOTH PRIMARY INPUT VOLTAGE AND OUPUT VOLTAGE, AND WITHOUT ELECTRICAL ISOLATION BETWEEN THE SAME. where: Peq = actual sizing power (core power)– Pn = rated nominal power (shaft power) — Vmax = highest voltage –Vmin = owest voltage. To establish the dimensions of the auto-transformer apply the formula to obtain an equivalent power level and then, on the basis of the power obtained, refer to the following tables.